Comments: Also known as "elk," Wapiti comes from the Shawnee Indian word meaning "pale rump." They are the largest member of the deer family in Kansas. They are a light brown below and darker brown across the back. Their rump and tail are straw colored. 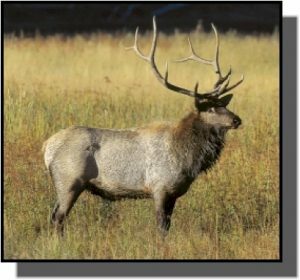 Mature bulls grow antlers nearly 5 feet long and 5 feet wide in summer and early fall. The antlers are carried through winter and are shed in early spring. In early autumn, "bugling" bulls announce their dominance during the breeding season. The bull's neck and shoulders swell and sparring bulls may dual over control of a harem of 10-20 cows. Herds congregate together in winter and cows deliver a single calf, usually weighing about 30 pounds, in early June. Wapiti live up to 15 years in the wild. Distribution: Wapiti formerly ranged throughout the North American continent north of Mexico. Today they are found in prairies, shrublands and woodlands of the Rocky Mountain region of the United States and Canada and the Pacific Northwest. There are a couple of small, free-ranging herds in Kansas. Food: Wapiti are primarily grazers feeding on grasses and forbs. In the winter they browse on shrubs, bark, and twigs.